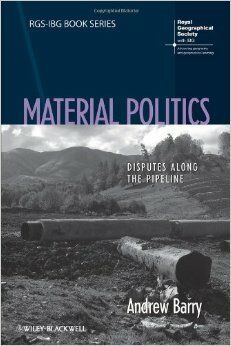 Free extended review of Andrew Barry’s Material Politics — even contains a reference to James Bond. thanks for sharing this, is there something that he reveals in this work that wouldn’t come thru in good reporting on the history of projects like the XL-pipeline we are fighting here? Extremely good question. I am not sure about the selection of cases for Andrew other than that it was somewhat “convenient” to study this case because all of the paperwork for the projects was released — more or less — at the same time (odd, given the emphasis on transparency, of course). Secondly, it was probably closer for Andrew being in the UK to head over to Turkey and adjacent areas. That is only conjecture, however. I have no reason — personal or academic — to think that his finding, that transparency does not delimit, but multiplies the surfaces upon which politics of a material kind can be generated, would apply to basically any case. XL pipeline, in that light, is as good a case as any other. Perhaps the only fully applicable idea would be to consider closely the role of transparency in order to ask “what are we not being transparent about?” because transparency is not a carte blanche expose of all things under endeavor — heavens no! Transparency is about selecting what is public and what is private under that same guise of fully public revelation. That it is not makes it all the sweeter for the corporation, which in the process appears all the more socially responsible. Public policing of the transparency practices seems like the primary public/political application of his work — to know that when they say they are “being transparent” we must know that they are “being (selectively) transparent” and search for and ask about what is not being told that is of relevance depending upon the concerned party and their role in things in due course. I guess I’m still stuck in the basic sense that all we can do as human critters is to manipulate/approach things from limited perspectives/interests/methods/etc and so can’t ever grasp the ‘whole’ thing/situation and therefore need to be open to correction and alternative perspectives, something perhaps basic and pragmatist (if not democratic), but than the work seems to be led by the particulars at hand and not something more general-izable, more about politics/co=operations than philosophy/theory. I see you point is less about academics and more about action (I misunderstood in the original asking). Truly, there is a problem that folks like Andrew (a great scholar, no doubt) is so busy being scholarly that he is no advocate or activist even though few people have seen that particular pipeline (that are not in the business of building it) as much as he did. With that in mind, I still think the insight about transparency holds, meaning, as soon as a company tells you that they are being transparent, it precisely at this moment that we know they must be holding something back likely of some relevance to the situation. The basic point: don’t buy into this transparency agenda because it is a shell game. Is that immediately applicable to activists on the ground? Sure. Is is a call to action or directive of sorts to guide behavior? Much less so. I guess it boils down to this: academics are generally in the game of knowledge collection (or information interventions, depending upon one’s perspective) in that game rewards insight over activism. In fact, I was once part of a lively discussion where activism was thought to cloud research quality and that scholars with activist agendas in concert with their research aims should not be funded. If these are not cease and desist orders, then I am not sure what they are. well trying to get at what theory might do that careful attention/research to the particulars at hand/play cannot, and still wrestling with the questions we come back to once is a while of whether or not one can/should say much in general about human doings.